The other animal that was in plentiful evidence during the hike was beaver (Castor canadensis). Dan actually saw one at the first pond we stopped at, toting a freshly-cut stick, but I missed it and that was the only individual observed. However, it was clear that beavers were not in short supply in the park. Virtually every one of the smaller water bodies we came across was the work of a beaver. And we came across a lot of small water bodies. I started taking photos of each dam as we found one, and I have photos of five total. 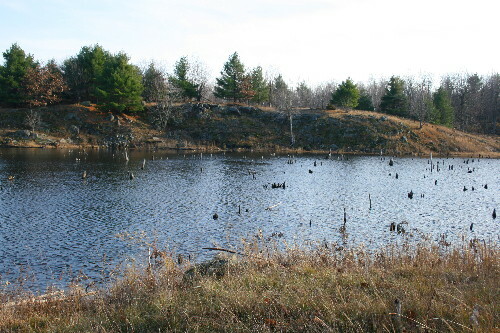 The above photo is beaver pond #6, the very first pond we came across, and the one where Dan spotted the beaver. We came across it mid-pond, and I didn’t notice the dam itself there; I suspect it was at the far end, the end we didn’t walk around. However, you don’t need to find the dam to know that the pond is beaver-made. Beavers live in two main types of habitats: large lakes that are pre-existing, where they build themselves a lodge but don’t need to go to all the work of making a dam, and in small beaver ponds that are of their own creation. We have a few beavers of the former sort living along the shores of Kingsford and Birch Lakes. The latter may be offspring that live with their mother and then inherit her dam and lodge when she dies, or ones that scout out a new site along the river. They’ll pick a spot along the river that looks promising, usually a narrower spot where it’s easy to bridge with a dam, and then get to work. The end result is that as the water in the river backs up behind the dam, the river basin or valley floods and the water rises into the surrounding forest and drowns the trees. In young beaver ponds these trees may be dead but still standing; in older ones most will have fallen and all that remains are the weathered stumps. Also, as in here and below, the slopes surrounding the water’s edge have been cleared of trees, looking a bit like a strange clearcut. 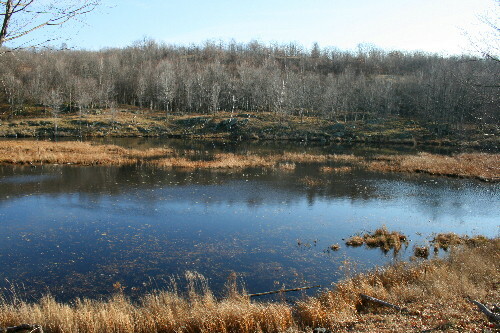 In areas where the landscape is relatively flat and the river basins shallow, the beaver ponds end up being wide and flat, and usually not very deep. We didn’t see many of those. The landscape here in the semi-Shield of the Frontenac Axis is very steep and rugged, and river valleys tend to be deep and steep-sided. In flat landscapes the beaver pond may simply look like a pond, but it’s often easy to tell that the ones here in the park used to be creeks, as they follow the contours of the steep-sided river valley. This is a very old dam, as evidenced by the grassy cover that graces its top. It almost looks like a deliberate, grown-over footbridge. Beavers often live in colonies, and although an individual beaver may live for 4-5 years (or as many as 15 for a lucky soul, though they can reach 23 in the protection of captivity), the dams and lodges can last a few decades as they’re “handed down” from one generation to the next. Beavers are meticulous in the care of their dam, plugging holes quickly to maintain its structural integrity, and regularly reinforcing it with new sticks. 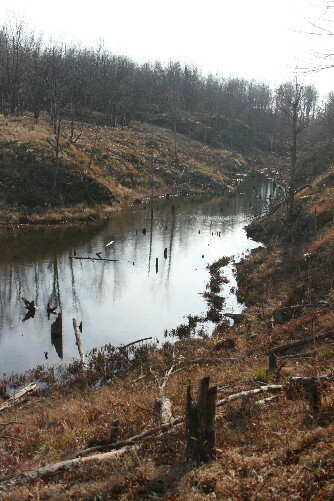 Dam #2, also covered in grass, on the left of the photo. 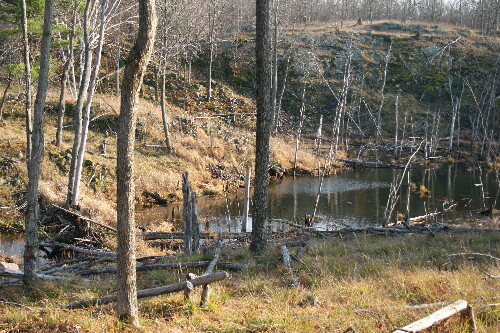 This beaver pond still has a lot of old wood standing in the water. 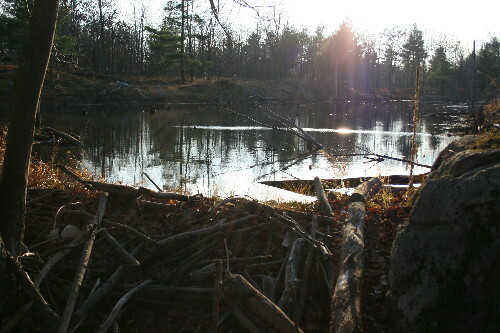 Beavers build dams and create ponds for the primary purpose of protection from predators. 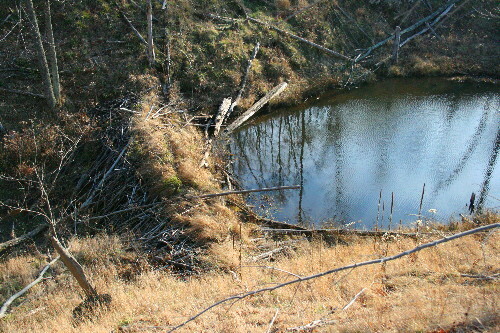 Ideally the resulting pond should be deep enough that the bottom doesn’t freeze in winter, and that allows the beaver to swim and dive for safety. 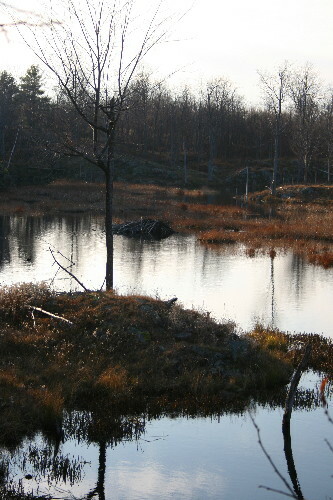 In ponds like this their lodge is usually a separate structure, in the centre of the pond surrounded by water (lake-dwelling beavers build their lodge on the shore, since the centre of the lake is too deep for a lodge). In the summer the “moat” protects the dwelling from potential predators. The entrances to the lodge are underwater, and the top is packed with mud which, when dry and frozen in the winter, form a nearly impervious barrier to the claws or jaws of predators that might cross the ice and try to break in. The pond also makes it easier for the beaver to tote branches from one area to another, for instance to mend the dam, since floating it on the surface provides much less resistance than dragging it across the ground. Finally, the pond provides food, growing the water lilies and other aquatic plants the beavers like to eat in the summer. Dam #3, less grass on this one. Note the fallen tree in the foreground. Once the beaver has picked a spot to locate its dam, it usually begins by felling a tree that is strategically located close to the river, such that when it comes down it helps to form the foundation of the dam-to-be. In the case of this one, its crown and branches would’ve created a great framework into which the beaver could fit the rest of the sticks and logs it brought over. It takes a pair of beavers only three or four days to build an average dam solid enough to begin retaining water. 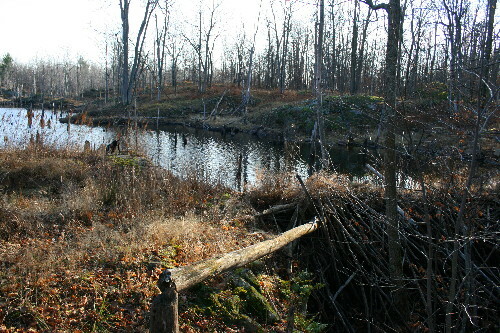 Although most dams are probably no more than a few meters or yards wide, in shallow landscapes beaver dams can become incredibly long as the waters spread out and the beavers build it wider to retain more water. The record-holder was found in Saskatchewan, and was 1,500 m (5,000 feet) long and 3 m (10 ft) high. The largest one currently in existence is 850 m (2790 ft), found on Google Earth in northern Alberta, and has been there for some 15 years. Another long one of 652 m (2,140 ft) exists near Three Forks, Montana. Dams across weak streams tend to be relatively straight, but ones built in stronger flows are usually curved into the direction of flow, to brace against the weight of the water pushing against it. I didn’t see the dam for this pond, but I did spot the lodge out in the middle of the water. A typical lodge is about 2 m (6.6 ft) high above the water, and 4-8 m (13-26 ft) wide at the water’s surface, but extends some distance under the water as well. It’s built so that the entrances to the inside chambers are accessible only from underwater. The beaver swims in the entrance into a preliminary chamber where they climb out of the water and allow themselves to dry off a bit, before continuing on to the main chambers. This helps to keep the main chambers drier, particularly in winter when things don’t dry out as quickly. Interestingly, beavers construct their lodge in a very similar manner to how we’d build a quinzhee, by creating a large pile of sticks and then “hollowing” out the living chambers, leaving a few branches in place for roof support. Beavers are nocturnal, so they spend much of their day snoozing in their lodge, probably the other reason we didn’t see many while we were out hiking. That’s all from Friday’s hike; although there were more pictures and things to share, it’s time to move on to other topics. Tomorrow: deer in the news. Beavers are nocturnal??? I’d always imagined the image on our nickels as being in full daylight. Like those deer hunters in your next post, I seem to have forgotten to ask some pretty basic questions.